The last few months of the year are a busy time for most people. You might be planning your holiday festivities, winterizing your home, and collecting all of your tax paperwork for 2019. But it’s important that you don’t let your chaotic schedule push oral healthcare off your list of priorities. By making sure that you use your remaining dental insurance benefits before they expire at the end of the year, you can save money and protect your smile. Most dental insurance policies come with an annual maximum — the highest amount that the insurance company will pay out for treatment within a calendar year. Usually, this maximum is somewhere in the ballpark of $1,000. If you only receive $400 worth of dental treatment in 2018, the remaining $600 from your insurance policy doesn’t roll over to 2019. It’s gone forever. The majority of people don’t take full advantage of their dental benefits; according to one estimate, only 2.8 percent of people with PPO dental plans meet or exceed their annual maximum. That’s a lot of money left on the table! To make sure you don’t let your benefits go to waste, it would be wise to schedule a checkup as soon as possible. Most insurance policies even allow you to attend two routine exams each year without paying anything out of pocket. At your appointment, you’ll learn about any advanced work you might need. You may be able to squeeze in those treatments before the end of the year so you can use as much of your policy’s annual maximum as possible. It might also benefit you to schedule major treatments across two calendar years. That way, you can take advantage of two annual maximums rather than just one. Some people hesitate to use their dental insurance because if they need a major procedure, such as a crown or root canal, they may still have to pay hundreds of dollars for the treatment. However, quite a few individuals have a flexible spending account (FSA) or healthcare savings account (HSA) that can step in to pick up where dental insurance leaves off. FSA funds may expire at the end of the calendar year, so be sure to schedule your treatment before that money disappears forever. While HSAs usually do not expire, you may still want to use those dollars before the end of the year in order to reap the biggest combined advantage from your account and your dental insurance. Time is running out to maximize your dental benefits in 2018! 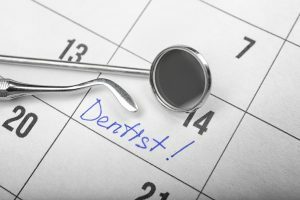 Whether you just need a checkup or it’s time for some major work, you can benefit your wallet and your smile by scheduling your next appointment ASAP. Dr. David W. Cleveland is a general dentist who earned his DDS degree from The Ohio State University in 2002. He works alongside the other doctors in our practice to provide excellent care to the Marysville community. If you would like to schedule an appointment with our practice so you can maximize your 2018 insurance benefits, contact us at 937-644-8822.